What makes us who we are? What shapes our hopes and dreams, and how do we adjust when things don't go as we hoped? Can we recover if we make a choice that's less than perfect? Voysey tackles these questions and others as he deftly weaves together Cuthbert's story, the history of early Christianity in England, and his own struggle to find his identity and purpose. His introspective writing leads readers to consider their own stories and reflect on how God calls each of us to an identity bigger than any earthly role or career. 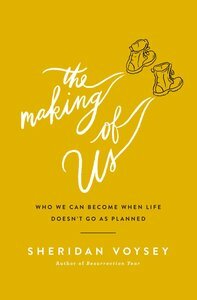 Part travel memoir, part pilgrim's journal, The Making of Us is a quiet story including a chapter-by-chapter reflection guide, of trust in God's leading for our lives, no matter where our paths take us.